I don’t want heavy-in on Chinese philosophy here, partly because I am not convinced Yin and Yang match very well onto what I have to say. 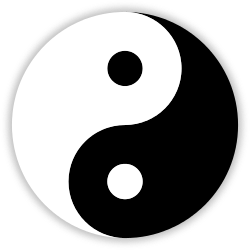 But they suit my purpose in that they represent different aspects of the same thing, and that thing is strongest if the Yin and Yang are in balance. Rather than enter into a debate about which aspects of wine appreciation are Yin and Yang, I am simply going to declare that I am using Yin to represent the tendency to collect wine and intellectualise about it, while Yang is for drinking and enjoyment. Yin is the shady side of the hill or valley. And where better to locate your cellar? It should of course also be underground, and with plenty of shelving for your unopened cases, and racks for bottles, each major wine region and producer in its own section. There may be a few wine books down there, but your main library of well-thumbed book is more accessible. Drinking wine breaks up your collection, and seems like a bit of a waste. If you are to open your bottles, you would prefer to use them as an educational opportunity, with like-minded people in vertical and horizontal tastings. Yin usually represents the female aspect of something, but I bet you are a bloke. Yang is on the sunny side, and in the summer you will be out in the sun drinking a bottle of something. You have a good palate, and can easily tell the difference between the good stuff and plonk without seeing the label, which is just as well because you really couldn’t be bothered to read the label. But you have a picture of it on your phone, and you might remember what you were told about the wine at the time of buying or consumption. Drinking wine gives you a great deal of pleasure at many levels, and you would find it hard to live without it. There’s a small selection of good bottles under the stairs, though you are never entirely sure what is there. Yang is supposed to be male, but you are just as likely to be female. I hope I have made my point by now: wine appreciation has an intellectual and a hedonistic aspect, but in my opinion it is strongest – and most fun – when the two are in balance. In my portrayals, I suspect that Yang seems more normal than Yin to most of us, as it is closer to the social-drinking end of wine appreciation. But do let at least a little Yin into your life, even if you think the balance should not be fifty-fifty. This entry was posted in General and tagged balance. Bookmark the permalink.